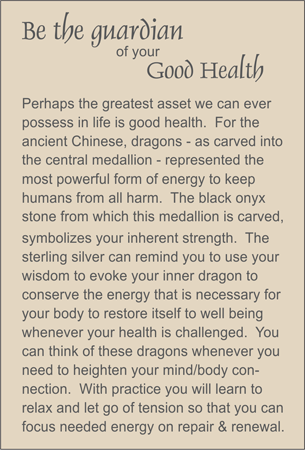 An open work, hand carved carnelian double dragon medallion recalls that dragons were considered by the ancient Chinese to be the most powerful protectors, and can be used as our reminder that we need to protect our own good health. This medallion is suspended from a necklace composed of amethyst tumbled nuggets inset with two carnelian nuggets. Amethyst ellipses provide punctuation. Sterling silver spring ring clasp.